Forever Young provides an environment for exploration, play and discovery giving the children the opportunity to choose activities that interest them. Our staff emphasizes activities that foster the physical, social, emotional, cognitive, and creative development of the child. The outside environment has a large secure play yard with grass, sand, and a tricycle path for the children to explore and enjoy during the day. The inside environment is designed to be safe and permit the child to develop at their own level. There is a separate sleep space so that children can nap on their own schedule. 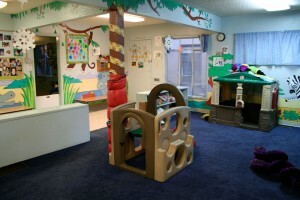 There are separate rooms and areas for non-mobile and mobile children.